You might pass Szentpétery Vera on the street in Gödöllő without registering her. If you didn’t know better, you might think her just another ordinary woman. But as Harvard professor Joseph Badaracco said: ‘within everyday ordinary people, if you look closely, you can find some extraordinary things’. And Szentpétery Vera is extraordinary. 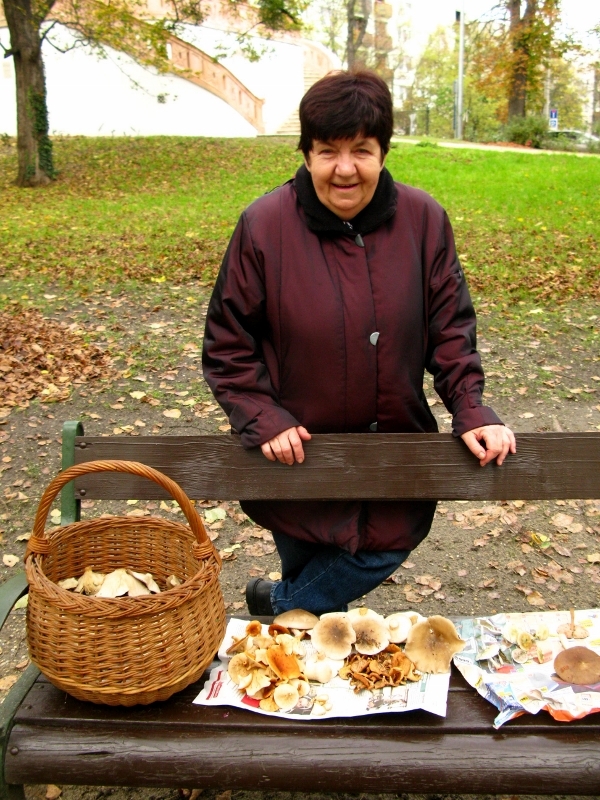 A gombaszakértő (mushroom expert), she is the go-to woman in the region if you forage for mushrooms and need advice. With more than 3000 varieties of mushrooms growing locally, of which just 500 are edible, there’s a fair degree of responsibility that comes with such expertise. One wrong call could mean certain death. We took her our haul some weeks ago. I watched in awe as she picked up each mushroom, examined it, and then put it in one of three piles: edible, inedible, and poisonous. Inedible covers the full gamut from simply not tasting nice to inducing severe vomiting or kidney damage – eating them won’t kill you, but you might wish you were dead. We visited again last weekend. This time I got to ask about her life. An only child, she learned what she knows from her father. He’d been in Horthy’s airforce, and even though he’d left to marry her mother and never saw action, the association made it impossible for him to find a job in the 1950s. She told us of how, back then, a serviceman with rank was expected to marry a woman of substance. The onus was on the woman to prove that she had means. As her mother couldn’t prove what she didn’t have, their only recourse was for her father to leave the airforce. This discrimination would continue into the 1970s and apply to her as well – an ‘x’ed’ child (her name had an x beside it on the school register), a child of someone who had been judged to be an enemy of the state, she never did get a major role in a school play. To a nine-year-old, that’s cruel. To a young adult refused a place in university because of that same x, it was life-changing. To me, in 2014, it is extraordinary. They lived quite close to the forest where mushrooms were in plentiful supply. Her father bought himself a book about mushrooms and later, in the 1970s, both of them took a year-long course in the Great Market Hall in Budapest, run by the Tudományos Ismeretterjesztő Társulat (Society for the Dissemination of Scientific Knowledge). Graduating with full marks, they were now certified to advise on mushrooms. Up until ten years ago, each market in Hungary that sold mushrooms was obligated to have a mushroom expert on hand. What distinguishes Szentpétery Vera from a number of her peers is that she doesn’t just separate – she teaches. She talks about each mushroom as if it were a friend – she gives its name, advises on how to cook it, or recounts the pain it can induce in some individuals while leaving others unaffected. Her passion is obvious; her willingness to share her knowledge is remarkable. She retired three years ago from her position as resident mushroom advisor and piac felügyelő (market supervisor) at the market in Gödöllő but is still sharing her passion with those who seek her advice. At the height of the season (which typically runs from late March to November, rain permitting) she might see 30 people each weekend and six or so during the week. So what makes Szentpétery Vera extraordinary? Her daily decisions can mean the difference between an enjoyable culinary experience, writhing pain, or certain death, and yet she wears this responsibility with a quiet assuredness. She is passionate in her love of mushrooms. But above all, she cares enough to want to share this passion, and her knowledge, with others. I am sure it is a good example of Mother Teresa’s’ saying ‘Be faithful in small things as it is in them that your strength lies’. It would need to be noticed by somebody Mary, and you have the patience and the wisdom to look deeper into people. Really enjoyed the write up.